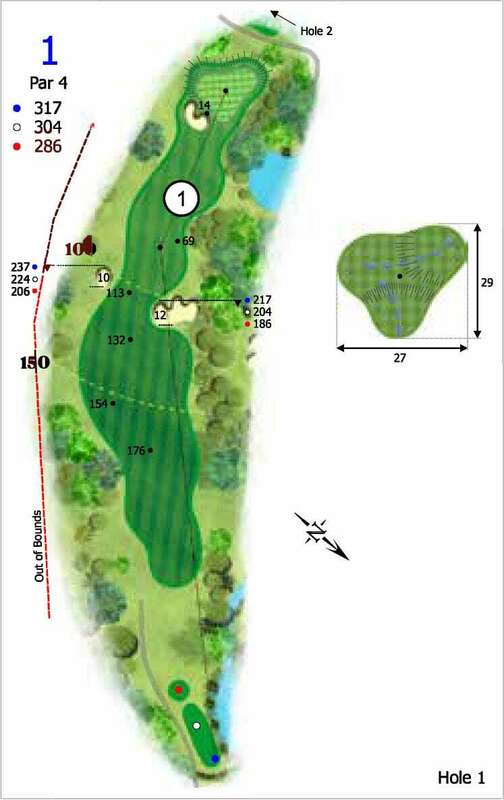 The first hole is a par 4 dog leg right requiring an accurate drive to a narrow landing area between two fairways bunkers. Your shot into the green is protected by a bunker and grassy shapes that will test your accuracy. The green is split into 3 levels providing many challenging pin positions and an introduction to the golf in front of you at Emerald Lakes. Safe Play: Lay up short of the fairway bunkers with a long iron off the tee, you will then have a mid to short iron into the green. Aggressive Play: Hit driver over the right fairway bunker towards the green leaving you a short wedge shot and a good chance at birdie.